This stallion at the University of Florida’s Institute of Food and Agricultural Sciences horse teaching unit in Gainesville, gets an acupuncture treatment from Huisheng Xie, BSc,VM, PhD, a clinical professor in the integrative medicine service at the UF Veterinary Hospitals. The UF Equine Acupuncture Center will consist of a 6,240-sf barn, which includes 12 stalls and a treatment area, and a 12,500-sf arena. 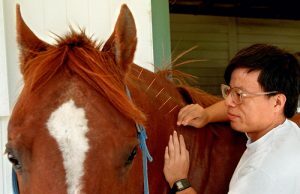 The center will function as a clinic through which Huisheng Xie, BSc,VM, PhD, a clinical professor in the integrative medicine service at the UF Veterinary Hospitals, will provide acupuncture therapy to aid in treatment of a variety of conditions affecting horses. Dr. Xie founded The Chi Institute of Traditional Chinese Veterinary Medicine in 1998. The new center will be located adjacent to the Chi Institute, about two miles west of Interstate 75 in Reddick. For more information about the new center, visit vethospitals.ufl.edu.